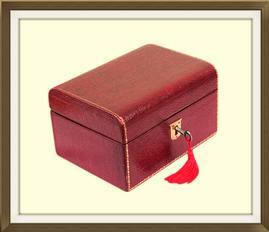 This is a charming little antique jewellery box, dating to around 1900. Its exterior has a textured maroon leather finish, with tooled gilt decoration to the edges, and there is a stylish brass escutcheon to the keyhole. The box is complete with a period key and it locks securely. The bottom of the box has a high quality watered silk covering. This is a lovely charcoal colour. 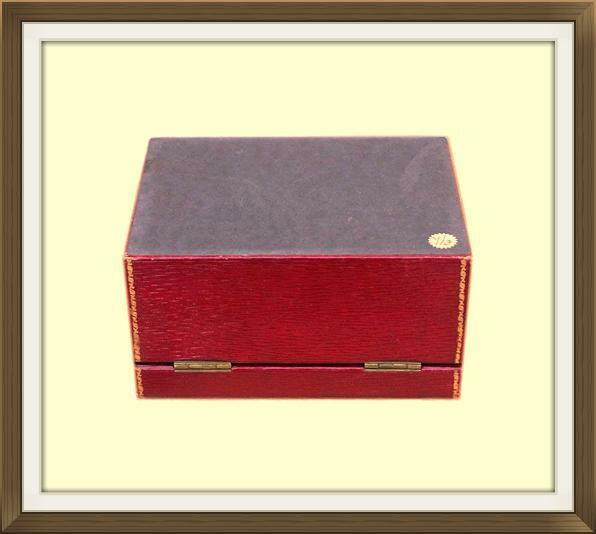 The box is complete with its original brass stop hinges which prevent the lid from falling back. It is also complete with its original high quality, patented British lock. This is stamped SECURE LOCK, BRITISH MAKE, PATENT NO 9538. The interior has its original lift out storage tray. with 3 individual compartments and two little ring storage sections. Beneath this is a larger and deeper single compartment. The centre compartment has a circular ring that was originally designed to hold a pocket watch. This is still a functional fitment, now ideal for holding a pendant or locket. The two side compartments are an ideal size for small pieces of jewellery such as pendants, earrings and brooches. 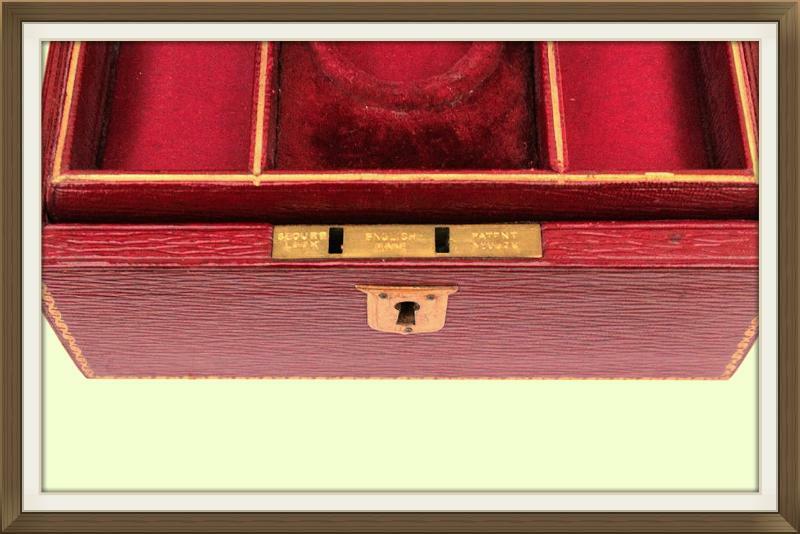 The little ring storage sections behind these compartments will each hold a narrow banded ring. The storage tray is finished with the same leather to that which is on the box's exterior. This is a nice size for larger pieces of jewellery such as bracelets, slim bangles, chains and beads. 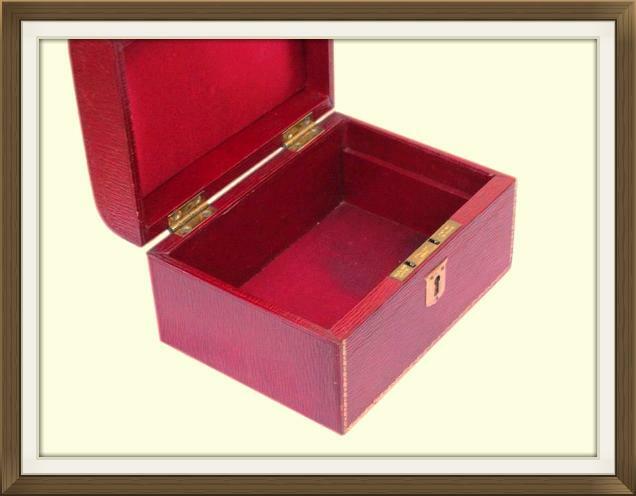 The base compartment, inside lid, and side compartments of the storage tray, all have beautiful maroon silk panels. 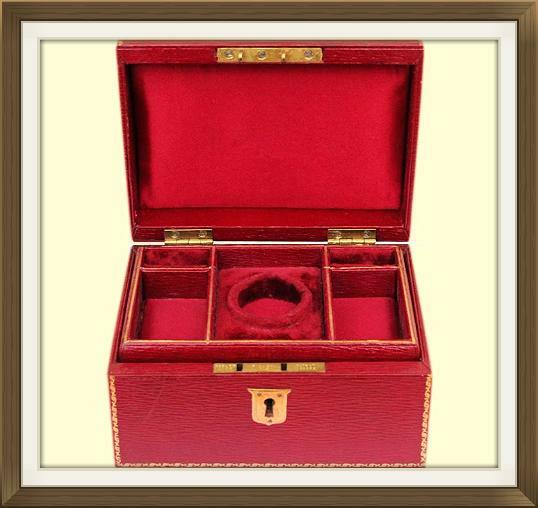 The centre compartment and ring storage sections of the storage tray, all have maroon velvet coverings. This box is in excellent condition for its age with very little wear. The leather is still beautiful with just a few minor marks, and all of the gilt to the tooling is still present. There are some surface scratches to the brass escutcheon from the key. The interior linings are in wonderful condition. They are still perfectly seated and have no splits or fraying. There is a dark patch to the satin panel in the larger base compartment, but this is not overly noticeable. The watered silk covering to the bottom of the box is in excellent condition. The condition of this box is so very nice and its evident that it has had very little use! 13.3 by 9.0cm with a 3.5cm depth. Each 5.7 by 3.3cm with a 2.0cm depth. 7.8 by 5.3cm with a 3.2cm diameter to the circular section.